Poland is in Eastern Europe. It is a little smaller than New Mexico, and has lowlands, a narrow coastal area with rocky cliffs, and a southern region rich with minerals and fertile farmland. Poland struggles with air and water pollution. In the late 1990s, Poland ranked twelfth in the world in industrial carbon dioxide emissions. Water pollution in the Baltic Sea off the coast of Poland is ten times higher than in the ocean at large. Environmental protection was a high priority for the government at the beginning of the twenty-first century. The Roman Catholic rituals of feasting and fasting, introduced to Poland around A.D. 900, have had a strong influence on Polish food traditions. During the fasts no meat is eaten, so many meatless and fish dishes have become a part of Polish cookery. Located between two powerful neighbors, Germany and Russia, Poland was forced to form many political alliances throughout its history. These influenced its food customs. For example, the marriage of King Zygmunt to the Italian princess Bona Sforza in the sixteenth century brought Italian food customs to Poland, including the introduction of salad. Since that time, the people of Poland, known as Poles, have called salad greens wloszcycna ("Italian things"). Other foreign dishes that were brought to Poland included goulash (stew) from Hungary, pastry from France, and borscht (beet soup) from Ukraine. However, all these foreign dishes have become part of a unique Polish cooking style. The cereal grains, grown on Poland's rich agricultural land, are among the country's most important dietary staples. These include wheat, rye, buckwheat, and barley. They find their way into dark bread, noodles, dumplings, and other everyday foods. Other important agricultural products include potatoes, beets, cabbage, carrots, mushrooms, and cucumbers. Boiled potatoes are the most commonly eaten side dish with meat, poultry, or fish. Cucumbers, seasoned with the herb, dill, are the raw ingredients of dill pickles, for which the Poles are known throughout the world. Cucumbers are also eaten in a salad with sour cream, another staple of the Polish diet. Vegetables are usually eaten boiled. Meat is an important part of the Polish diet. Pork is the most popular meat, and the most commonly eaten meat dish is a fried, breaded pork cutlet served with thick sauce. Beef, ham, and sausage are also eaten regularly. The meat stew called bigos is often called the national dish of Poland. Other famous Polish dishes are golabki (cabbage leaves stuffed with ground meat and rice) and golonka (fresh ham served with horse-radish). Poles also like to eat smoked and pickled fish, especially herring. Most Polish meals start with one of Poland's many soups. These range from clear broth to thick soup so hearty it could be a meal in itself. The best known is the beet soup called borscht. Poles love desserts, especially cakes. Popular cakes include cheesecake, sponge cake, poppy seed cake, and a pound cake called babka. Special cakes are baked for feast days and weddings. Popular beverages include coffee, tea, milk, buttermilk, and fruit syrup and water. However, vodka distilled from rye is known as the national drink. Fry bacon pieces in Dutch oven or large saucepan over high heat for about 3 minutes. Carefully drain off some of the fat, leaving just enough to coat the bottom of the pot. Add pork, garlic, onions, and mushrooms, and, stirring constantly, fry until meat is browned on all sides, about 5 minutes. Reduce heat to medium. Add beef broth, sugar, bay leaves, drained sauerkraut, apples, and tomatoes with juice. Bring the mixutre to a boil, increasing heat if necessary. Reduce heat, cover, and simmer stew for about 1½ hours, stirring occasionally to prevent sticking. Add cooked ham and sausage, and stir. Cover and continue to simmer over low heat for about 30 minutes more to blend flavors. Remove bay leaves and discard before serving. A plateful of cheese pierogi, topped with a dollop of sour cream, makes a filling lunch or dinner. Make dough: Combine the flour with the egg, a dash of salt, and as much water as needed to form a smooth, loose dough that is easy to handle. Roll with a rolling pin or bottle until it is very thin. Using a drinking glass or biscuit cutter, cut out circles 2 inches in diameter. Make filling: Mix the cut-up apples with the breadcrumbs. Assemble pierogi: Place a spoonful of apple mixture in the center of each dough circle. Fold the dough circle in half and press around the edges firmly to seal. Fill a large pot with water and heat until the water begins to boil. Drop the pierogi gently into the boiling water and cook until they float to the surface. 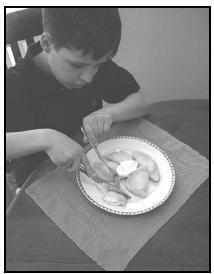 Remove with a slotted spoon, allow the water to drain off, and place the pierogi on a serving platter. Top with sour cream or confectioners' sugar. Makes 5 or 6 servings. Pour boiling water over the cabbage to loosen the leaves. Remove a few leaves at a time as they soften. Place the rice in 1 cup of water and boil 10 minutes. Sauté the onions in butter until partly browned. Combine with the rice, meat, egg, salt, pepper, and garlic powder; mix well. Place some of the meat mixture on the stem of a cabbage leaf and roll over once. (Part of the thick stem section can be cut off first for easier rolling.) Tuck in the sides of the leaf and finish rolling. If needed, fasten rolled leaf with a toothpick. To cook, place the slices of bacon with a few cabbage leaves and any leftover small leaves at the bottom of the baking dish. Place the rolls on top, cover with the tomato soup, and place any leftover cabbage leaves on top. Cover with a lid or foil and bake about 2 to 2½ hours at 300°F. This fragrant mixture of dried fruits and spices is served at the end of the festive Christmas Eve dinner. Poland is a heavily Roman Catholic country, and many Poles observe Catholic fast days by not eating meat. Traditionally, many meat substitutes have been made from mushrooms. The two most important holidays are Christmas and Easter. The traditional Christmas Eve dinner consists of twelve or thirteen courses. There is one for each of the twelve apostles (Jesus of Nazareth's followers) in the New Testament of the Bible. Sometimes there is a thirteenth course for Jesus. No meat is eaten at this meal. The main dish is carp or pike (two types of fish). Carp is served with a sweat-and-sour sauce or a spicy horseradish sauce. Other traditional dishes include mushroom soup, sauerkraut, pierogi (Polish dumplings), noodles with honey and poppy seeds, and poppy-seed rolls. Cookies and cakes are also served, and some cookies are used to decorate the Christmas tree. Easter is the second most important religious feast of the year. The fast of Lent is broken with Easter breakfast, and feasting continues through the day. Traditionally, a roasted lamb was served for Easter. In recent years, a lamb made of sugar or butter has replaced the real lamb. Meats served for Easter in modern Poland include roast turkey, ham, sausage, veal, or a roast pig. Painted hard-boiled Easter eggs are part of the celebration, and everyone eats part of an egg. Easter sweets include babka (rich pound cake) , cheesecake, and mazurek (a Polish shortbread). 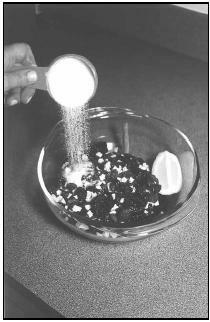 Soak the raisins in hot water for 15 minutes. Pay dry and coat with 2 Tablespoons of flour. Set aside. Beat the egg whites and salt until stiff. Place the egg white mixture in the freezer for 5 minutes. Combine the cream cheese, sugar, egg yolks, and remaining flour; beat until smooth. Stir in the raisins and lemon peel. Carefully fold in the egg whites. Pour the mixture into a greased and floured 9-inch springform pan (a special baking pan with a removable bottom). Bake for 45 minutes, then turn the oven off and leave the cake in the oven until it cools. Cook noodles according to directions on package. Meanwhile, combine poppy seed filling, honey, and cream in a mixing bowl and stir until smooth. Stir in raisins. Melt butter in double boiler. Add poppy seed mixture and heat thoroughly. Pour poppy seed mixture over hot, drained noodles and serve immediately. Dried Fruit Compote is usually served at the end of Christmas Eve dinner. Combine prunes, mixed fruit, apricots, lemon juice, ¼ lemon, cloves, cinnamon, and sugar in a pot. Pour boiling water over the fruits to cover. Cover the pot and let stand overnight (at least 4 hours), covered. Add the apples, and simmer the mixture on medium heat for 5 to 7 minutes. Taste and season with sugar and lemon if necessary. Allow to cool to room temperature and serve. Poles like to eat hearty, filling meals, and they eat four meals a day. Sniadanie (shnah DAHN-yeh, breakfast) is eaten between 6 and 8 A.M. It includes many of the same breakfast foods eaten in the United States, such as scrambled or soft-boiled eggs, rolls with butter, bagels, and, in winter, hot cereal. However, cheese and ham or other meats are also served. Coffee, cocoa, or tea with milk is served, or even hot milk by itself. Between 11 A.M. and 1 P.M. , a light meal, or "second breakfast," is eaten. It is similar to lunch in the United States and may consist of a sandwich, soup, fried eggs, or a plate of cold meats. Children usually take sandwiches to school for their midday meal. The main meal of the day is obiad (oh-BEE-ahd, dinner), served in the late afternoon (usually between 4 and 6 P.M. ). There is usually at least one meat dish, boiled vegetables or salad, some form of potatoes, soup, and a grain dish or dumplings ( pierogi ). The Poles like both their meat and vegetables cooked until they are very tender. A sweet dessert, usually cake, is served at the end, with a beverage. The last meal of the day is a light wieczerza (wee-CHAIR-zah, supper), served at about 8 or 9 P.M. in the evening. It includes a hot or cold main dish, pickled vegetables, a dessert, and hot tea with lemon or hot cocoa. When they have to "eat on the run," Poles can pick up an inexpensive meal or snack at small places called milk bars ( bar mleczny ). Western-style fast foods, including pizza and hamburgers, are also available. A popular Polish "fast food" is flaki, a dish made from tripe (cow stomach). It is either boiled or fried with carrots or onions. Brush the mushrooms to clean off any grit, and rinse them under running water. Chop them into half-inch pieces. Bring beef broth to a boil. Add the barley, and boil for 10 minutes. Add remaining ingredients, and simmer for 1 hour. Kielbasa, cut into bite-sized pieces, may be combined with cabbage for a hearty dinner, or may be enjoyed alone with mustard as a snack. Place the vegetables, seasonings, and sausage in a crockpot. Cook on low 6 to 10 hours, or on high 2 to 4 hours. Mix the bread with the onions, egg, and meat thoroughly. Add salt and pepper. Form small balls from the mixture and roll them in flour. Melt the butter in a frying pan over medium heat, and add meatballs. Brown the meatballs on all sides. Pour the bouillon over the veal balls, cover, and simmer for about 20 minutes. Place on a warm serving platter. Add the rest of the flour to the pan drippings and bring to a boil. Remove from heat and season with salt, adding the sour cream and dill. Pour over meat. Wash the eggs, place in a pot, and cover with cold water. Heat until the water boils and cook over low heat for 10 minutes. Remove the pot from the heat and drain the water. Place the pot with the eggs in the sink under cold running water to cool the eggs. Peel the eggs, and carefully slice each egg lengthwise into halves, being careful not to break the whites. Scoop out the yolks. Place them in a bowl and mash them with a fork. Mix 1 Tablespoon of the breadcrumbs and the rest of the ingredients except the butter into the egg yolks. Spoon the mixture back into the egg white halves. Sprinkle with the remaining breadcrumbs, and flatten with a knife. Heat the butter in a large skillet. Carefully add the eggs, stuffing side down, and sauté them until golden. Serves 7 to 10 as a snack. More than half of Poland's land is used for farming. Polish farms don't produce as large a crop as farms in other parts of the world, because of poor soil and lack of rainfall. In the late 1990s, Polish farmers began to use more mechanical farming aids, such as tractors, which helped to improve the size of the crops. Polish farmers grow fruits and vegetables. Since the 1950s, Poland has been forced to import wheat, since it can't produce enough on its own. Davidson, Alan. The Oxford Companion to Food. Oxford: Oxford University Press, 1999. Gorgey, Maria de. A Treasury of Polish Cuisine. New York: Hippocrene Books, 1999. Halvorsen, Francine. Eating Around the World in Your Neighborhood. New York: John Wiley & Sons, 1998. Nowakowski, Jacek, and Marlene Perrin. Polish Touches: Recipes and Traditions. Iowa City: Penfield Press, 1996. Webb, Lois Sinaiko. Holidays of the World Cookbook for Students. Phoenix: Oryx Press, 1995. Zamojska-Hutchins, Danuta. Cooking the Polish Way. Minneapolis: Lerner Publications, 1984. Epicurious. [Online] Available http://epicurious.com (accessed February 7, 2001). SOAR (online recipe archive). [Online] Available http://soar.berkeley.edu (accessed February 7, 2001). This website is very good and doesn't need anymore touchups. And the recipies came in handy when my polish family came to visit me. This website is amazing. I am currently using it for a project on Polish soups. I will definitely use it as a reference in the future. Great website and perhaps some other user can help me. 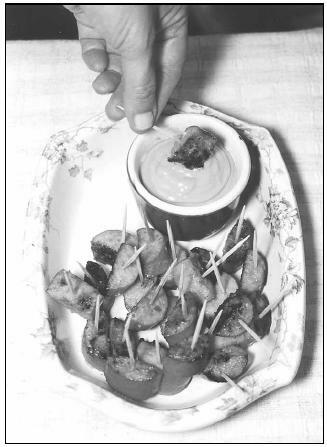 I remember a side dish served at family Christmas celebrations -- pickled mushrooms and a/b/c noodles. Could have Polish or German origins. Does anyone have a recipe? This is very popular side dish in Poland, each family has own receipt passed to next generations. It teasts great with any smoked meat or with shot of cold vodka. Prpearation time abt 45 minutes. Clean and wash mushrooms, put to the pot, pour water, add salt and few tablespoons of vinegar - mushrooms will not not darken. Cook slowly, when the water boils collect noise that appears on surface. Mushrooms are ready after about 15 minutes - when they land on the bottom of the pot. Drain off in a sieve. To the sterilized jars, put two slices of carrot - can be more matter of taste, slice of onion, the bay leaf and 2 grains of allspice. You can also add a clove of garlic, 2-3 grains of pepper, small piece of horseradish root - all depending on your preferences. Put mushrooms to the jars and pour the hot marinade. Mushrooms should be completely covered. Turn caps and pasteurise about 15 - 20 minutes in a pot of boiling water. Mushrooms are ready after about 2 weeks and can be stored in a cool place for more than 12 months. The last meal of the day is called kolacja, not wieczerza. The word wieczerze is rarely used and usually referes to the Christian last supper. I am Polish and I live in Poland so you can take my word for it. Alos, obiad is eaten so late (4-6 pm) usually in the urban areas from monday to friday after work. However in the country side (and on weekends in the urban area as well) most of people don't eat second breakfast and just have the obied earlier (1-2 pm). A friend said he grew up eating a traditional sandwich meat called swanina (spelling?). It was raw bacon that was sliced & put into sandwiches, I have never heard of this. Can anyone clarify my doubts? My polish Momma has passed dso I can’t rely on her expertise. Thanks!